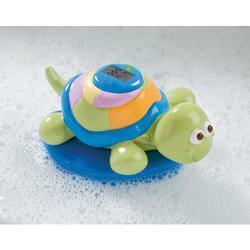 The Digital Temperature Tester from Summer Infant helps to regulate water temperature while providing your little bathing beauty with a cute turtle playmate. The red, yellow and green LED lights and large LCD screen visually show parents if the water is too hot, too cold or just right. The water temperature is recalculated every 10 seconds and there is a 10 minute auto shut off to preserve battery life.